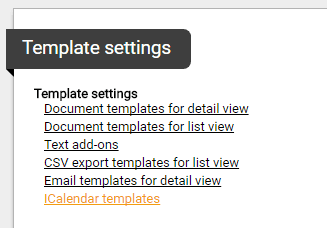 You can access the iCalendar templates via System settings > Template settings or via Personal settings > Template settings. 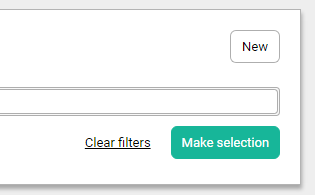 Click New in the Selection tool. By selecting the red icon, a pop-up with available merge fields will appear. Select the merge fields you want to include in the template. You can also insert plain text in the template. 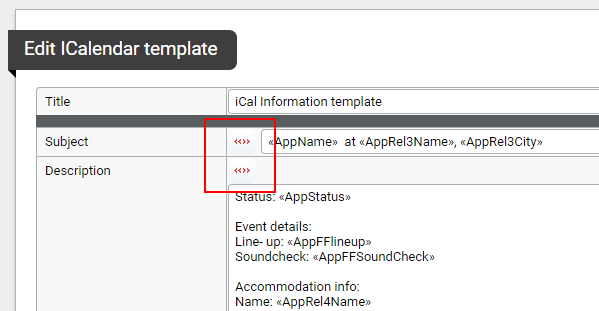 Navigate to the artist profile in the company section to assign the template to the iCal feed of a user. Scroll down to see the available iCalendar feeds and select the feed you want to update. At the Display, choose the iCalendar template from the drop down menu. The information in the iCalendar feed of the user will update according to the selected template.